If I want to shoot darker shots, is it better to increase the lighting and then darken in post to retain clarity? I'm just getting started - in my last shoot, I was using a 6D with a 50mm/1.4. In low light, the pictures looked fantastic on the viewfinder but on the computer screen, appeared extremely grainy. Should I shoot with way more light / lower ISO to retain clarity, and then just darken in post? What kind of setup would be needed to achieve the above? Any tips would be much appreciated. Just because the image is mostly black doesn't mean the scene is dark. With a flash positioned on the left pointing at the subject (he's facing the flash) and a black backdrop you could possibly even pull this off in daylight. Start with a low ISO, a middle of the road aperture and the sync speed for shutter speed (probably 1/200th or 1/250th). The point is to kill the ambient light entirely. Take a test shot without the flash. If it's not entirely black, close the aperture even further. When the image is fully black, turn on the flash. Make sure to prevent any light spill on the background by pointing the flash slightly away from the background, flagging, zooming and/or snooting it if necessary. Glyn Dewis describes the technique in this article and he doesn't even need a black backdrop. The look you are going for is known as low key lighting. It is not necessary for the room to be dark. You just need to put enough light on your subject that there is a large enough difference between the shadows and the highlights. I took this self portrait by shooting into a mirror in a fully lit room. By using a good amount of flash power I could use a fairly narrow aperture at a low ISO setting and a moderately fast shutter speed. There was a black curtain about 15 feet behind me. The only difference here is the direction of the light with reference to the lens' optical axis, and of course full color instead of monochrome. For my shot it was at about a 45º angle to one side and also a 45º angle below my subject. (Me!) For the example on the question it is at about a 90º angle to the side but at the same height as the subject's face. For that kind of work, ISO 6400 is awful high with any camera. You're going to give up a lot of dynamic range as well as detail (via the noise reduction required) when shooting at such a high sensitivity. 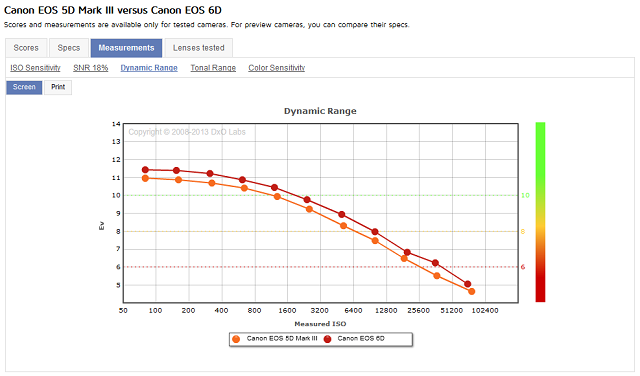 Here's how dynamic range drops off in the 6D as the ISO setting is increased. (As tested by DxO Mark here. To use the link you'll need to click on measurements-->dynamic range-->screen to view the info shown below). I've included the 5D Mark III in the comparison because it is interesting that the 6D seems to have tested at about a 1/2 stop advantage in terms of DR, even though the SNR tab shows both have near identical Signal-to-Noise Ratio curves. Here's the SNR tab from the same link above. Although I haven't used the 6D, I find that with my similar 5D Mark III, ISO 1250 or 1600 is about as high as I want to push it in a controlled environment. When an image is properly exposed at those setting, noise is very manageable without too much loss of detail. And there are not really many reasons to ever push it that far. ISO 800 and below are very clean on the current crop of Canon EOS FF bodies. If you can add light to lower your ISO at least a couple of stops then that is the best solution. As you add light to your subject and reduce your ISO you can keep the background dark by shading the background from the light of the flash and closing your aperture if needed. If you are using f/1.8, try f/2.8, f/4, f/5.6, f/8, etc. until the background is dark enough. With normal flash, you can't shorten the shutter speed beyond your camera's sync speed (1/180 sec for the 6D) without one of the shutter curtains blocking a portion of the sensor when the flash fires. The main concern isn't how dark or bright the scene itself is, but rather how much difference in brightness there is between the subject and the backdrop. If you can't add light, then if the camera isn't already on a tripod put it on one and lengthen the shutter speed enough to lower the ISO a couple of stops or more. In that case you will probably need to pull the shadows down when you edit. And just another tip when selecting an ISO setting: In general, when you are concerned about noise you should probably avoid the + 1/3 stop ISO settings (125, 250, 500, 1000, 2000, etc.) with current Canon EOS cameras. 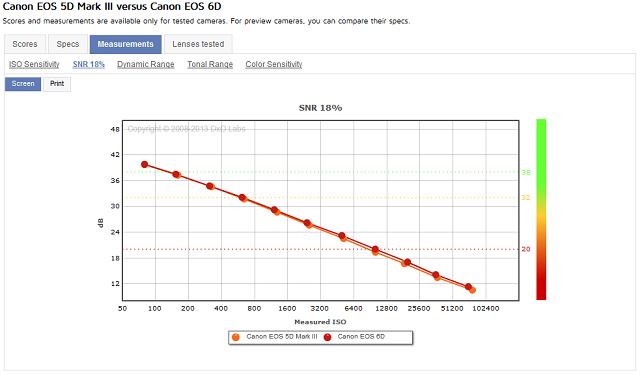 This is due to the way EOS cameras adjust for ISO settings not 100 x powers of 2 (i.e. 100, 400, 800, etc). 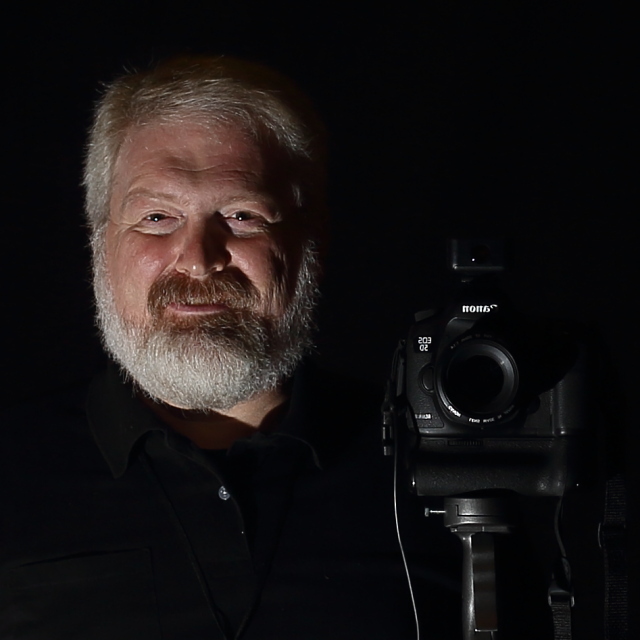 Some tests show less noise at ISO 1250 than at ISO 125! Your ISO is causing your grain issue. I have a studio assignment I give my students that is very similar to what you are attempting to recreate. It can be done with a single hot light or even window light as suggested. 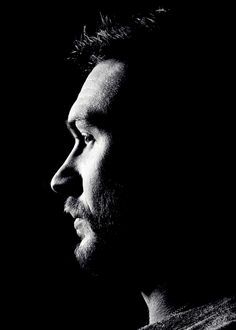 It's fine to use a black background, though just a dark one would do if you're going to covert to black and white in post. Position the backdrop a fair distance from your subject. It's best to experiment with this, but a white backdrop shot in full color will usually go dark gray in three feet or so, if the light is focused on just the side of the face. The light will fall off long before it hits the background and it will appear much darker, usually with more consistent results. Are there standards for 5 star rating scales of photos? Does rotating a photo count as a destructive editing? Why did exposing for the highlights and raising shadows in Adobe Camera Raw result in so much noise? Where is the border between raw developing and photo manipulation?